I still haven’t figured out which novel involved the brothers but the gothic book with ghost in the title is The Ghost Writerby John Harwood. This is a gothic tale with several layers to it. Gerard Freeman finds a hidden drawer of his mother’s where he sees a picture of a mysterious woman he knows nothing about. His mother is not happy at all when she finds out he knows about the photograph. They are close and she often tells him stories of her idyliic childhood on the family estate. A few years later Gerard strikes up a pen pal relationship with a girl about the same age who is disabled. Eventually he goes to his mother’s childhood house to learn “the truth” about his mother. I remember this one being a little bit creepy and it is a book where the details matter to the plot(s). Looking at some of the Amazon reviews quite a few people were disappointed in the ending. I think I’m going to re-read this one to see if it holds up or not. 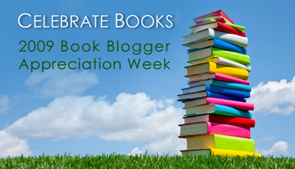 It’s that time of year again… Book Blogger Appreciation Week! Today is interview day and I’ve been paired up with Suey of It’s All About Books. I hope you enjoy getting to know Suey like I did. Amber: How did you decide to name your blog “It’s All About Books… and life’s other adventures too!”? Suey: When I created and named my blog, I didn’t know it would become, shall we say, such a big part of my life! I was just thinking, hmmmm, I want to do a blog all about books, hey I know! I’ll call it “It’s All About Books”! So uncreative. But it’s now grown on me I suppose. I added the “…. and life’s other adventures too!” awhile after when I realized I felt the need to do personal posts about family, music, TV and whatever else was going on now and then. Amber: What is your favorite part about book blogging? Suey: I really enjoy being able to have a place to be openly and maybe even overly enthusiastic about my book fanaticism. People in my real life think I’m weird, but now I’ve found people in my blogging life who totally get it. They may still think I’m weird, but at least they get it! That’s the best part. Amber: Is there one book (old or new) you recommend to others without hesitation? Suey: Ah, hard question because it just depends on the person I’m recommending to. I guess The Book Thief always seems to come up when I’m suggesting something for people to read. The Hunger Games for reluctant teen readers. Ender’s Game for teenage boys. And the list goes on! an active book blogging community where you live? Suey: It’s kind of the same as the best part of book blogging itself, only in person. Meeting people with the same excitement about books and reading… and blogging… is so fun! You have an instant connection and an instant bond. It’s a very cool thing to experience. Several of the Utah book bloggers I see enough now to consider “real life” friends and some of them even come to my book club now! I love it. I feel very lucky to be part of this fun book community that we’ve got going. Amber: Do you set reading or reviewing goals each year? Suey: I sort of have an unwritten goal to try to get to 100 books a year. That’s nice round number! The reading challenges I join, which I try to make only 3 or 4, helps me create some goals. This year I have a personal quest to read Robert Jordan’s Wheel of Time series, but I’m only to book four at this point. One year, I wanted to read War and Peace, but I only got half way through. So, yeah, I guess I do make reading goals. But as for reviewing goals, I just plan to review everything I read. Simple, easy, short, chatty reviews. way you read or review books? Suey: The specific things you list haven’t really changed the way I read or review books. Goodreads maybe a little, if I see someone list a book that looks good, I’ll add it to the virtual pile. Blogging itself is what has changed my habits the most. The TBR pile is huge because of the rave reviews I read and because of the buzz that happens now and then over certain books. I’ve read a ton of stuff since blogging that I would have never known about otherwise. As far as e-readers go, I’m still wary about that whole thing. I’m sure some day I’ll try it out, but for now, I’m just a normal paper books kind of reader! I’ve been mostly posting reviews this summer but I’m still here! In fact, just last week I finished up my judging for Book Blogger Appreciation Week. Have you registered for BBAW this year? My site was offline for a day or two but I decided to not extend the giveaway. Instead, I’ll have another giveaway when I return from vacation. The winner of Norah Labiner’s book, German for Travelers, is SFP at Pages Turned. Congratulations, SFP! The winner of Dave Egger’s book, Zeitoun, is Karen at Bookin’ With “Bingo“. Congratulations, Karen!